For those of a nervous disposition the fourth offering in Carter's excellent crime series should be approached with caution, leaving all the fun of this dark and visceral thriller to us hardier souls. Carter is gathering quite a momentum with this series which achieves something that very few other crime authors balance successfully, that is empathy for both the victims and killer evinced in the character of Detective Robert Hunter. Through the single minded determination of Hunter, we are witness to one of the most multi-faceted detectives in crime fiction - highly intelligent, perceptive, focused and tenacious with an inherent need to analyse and predict the actions of the killer submersing himself into the realm of a killer's mind as this killer seeks to test Hunter to his limit. 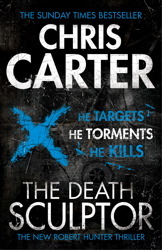 With each book you cannot believe that Carter could create a killer more disturbing than in the book before, and although he succeeds as the extreme visceral nature of the crime scenes attest, he cleverly gives the reader a way to engage with the killer's seemingly depraved actions in the great reveal, and to garner a particular understanding of the emotional motivation to commit such acts, hewn from the author's previous career as a criminal psychologist. As a reader you are aware of this challenge to your rationale but it gives you the chance to question your own preconceptions of good and evil, the propensity of humans to kill when faced with emotional trauma or physical threat and to what extent the ferocity of the killing method manifests itself. On a lighter note through the interplay of Hunter and his police partner Carlos Garcia, (which is probably Hunter's most established relationship as he seems for the most part oblivious to his effect on women) there are perfectly pitched moments of camaraderie and humour which lighten the overall claustrophobic and disturbing nature of this particular case and on an even lighter note - hang onto your stomachs guys, you're in for one hell of roller coaster read! JF blogs at Raven Crime Reads.